AO Glass Works bottles at "Supercool Glass"
The saying "laughter is the best medicine" is so common that it sounds trite. But for Burlington artist Holly Jeffers, the truism inspired an imaginative leap: If you could bottle laughter and keep it around for a challenging day, what would the bottle look like? That's what Jeffers found herself wondering five years ago, when her mother fell ill. "I'd go to her home to check in ... we would talk about what the kids were doing and all that," Jeffers says. "I came to believe that sentiment absolutely, that laughter just helps." Jeffers, who has four children of her own, began to notice different qualities in the laughs of people around her — hearty guffaws, hesitant chuckles and the unself-conscious giggles of her children and their friends. "When I started paying attention to people's laughter, it just happens that you do start to picture it," she says. Those mental pictures began to take the form of a children's story. And then a book, and then an unexpected art project that would end up on display in the Shelburne Museum's new exhibit "Supercool Glass." Before the art, though, came the story. 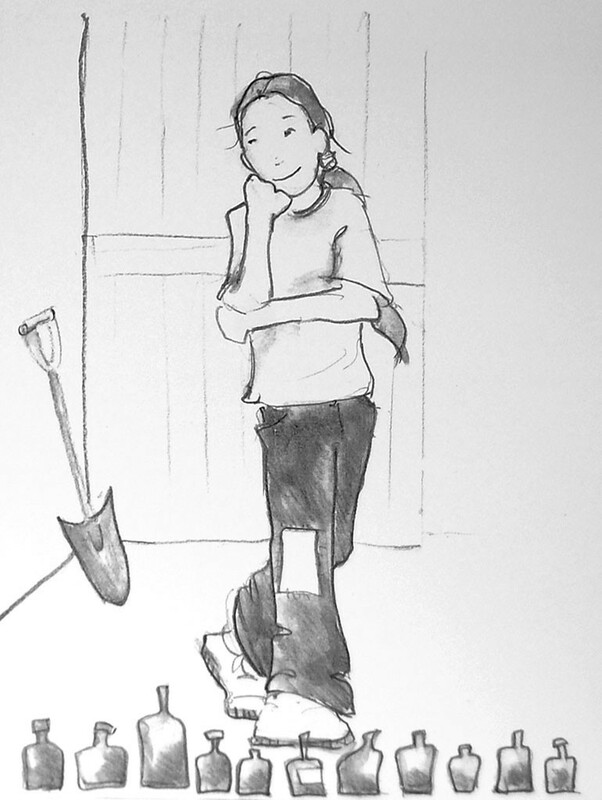 Jeffers, who frequently reads and tells stories to her kids, imagined a protagonist named Lotta. She's a composite of "all children" who encounters various characters and captures their different-sounding laughs in bottles. "Lotta is every child at that stage when everything is awesome," Jeffers says. "They don't walk to places; they run to them. They're excited, and they can ... take something that we hear all the time and just breathe new, creative life into it." Before long, Jeffers began to envision unique bottles that represented the personality of the person whose laughter they contained — bottles of different colors, shapes and textures. Enter Burlington glass artists Tove Ohlander and Rich Arentzen, who own AO Glass Works on Pine Street, and from whom Jeffers rents a painting studio. "I had approached them and said, 'You know, if I ever get this book done, it would be really fun if in the back of the book we had a photograph that showed all the bottles,'" Jeffers recalls. The couple was enthusiastic about blowing bottles for each character. And when Jeffers did complete the story, Ohlander jumped in as the illustrator as well. "I started working on the pictures, but you know, even though I paint, to do kids is really hard," Jeffers admits. Swedish-born Ohlander, who was a painter and illustrator before turning to glasswork at age 23, had an instinct for capturing children and sketching quickly. Ohlander likens "making those fast sketches" to the quick decisions necessary in working with glass. As it happened, Ohlander and Arentzen had a special glassmaking gig in the works. Last spring, Shelburne Museum curator of design arts Kory Rogers approached the couple and asked them to participate in an exhibit of contemporary glasswork. They agreed — and pulled Jeffers and their book project on board. "Supercool Glass" opened at the museum's Pizzagalli Center for Art and Education last Thursday with a stunning array of contemporary and traditional glasswork. Along with glass-encrusted living room furniture, 19th-century artifacts such as a box of glass eyes, and a mega-size glass chessboard, the "Laughter Is the Best Medicine" installation by Jeffers, Ohlander and Arentzen has attracted a steady stream of exhibit-goers. 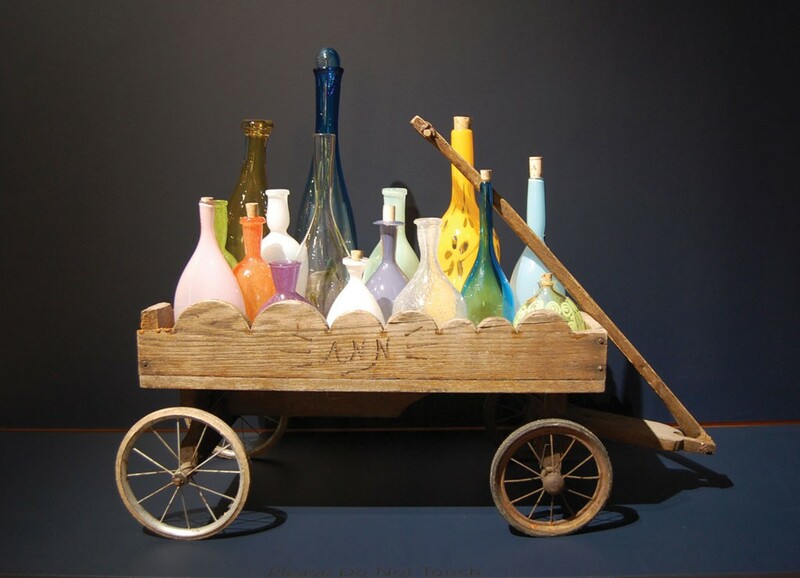 On display are the elaborate glass bottles that the trio created for Jeffers' characters, arranged in an antique child's wagon. Beside the bottles is a hand-bound copy of the book. Amazingly, the glass component of the installation came together in just three weeks, the artists say. They spent January brainstorming the elements of each bottle based on ideas they had for each character. After sketching out each one, the glassblowers immediately hit the studio. "I would say to Rich, 'What technique would you use for this laugh?'" Ohlander says. "It made us make new pieces that we hadn't done before, so it was very fruitful. And it's the very best, as far as collaborations go ... It was just genius."